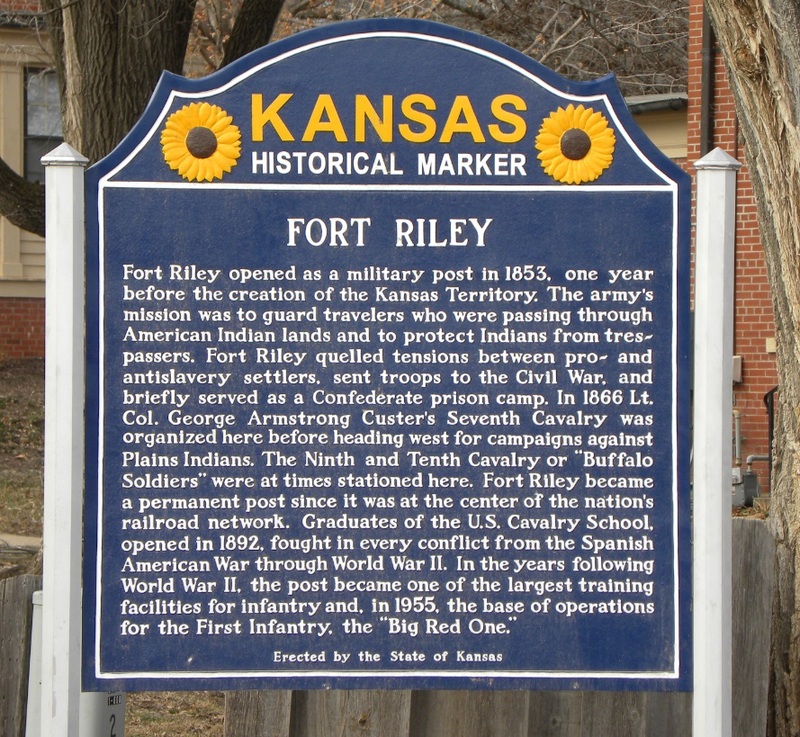 Fort Riley is a military reservation located near Junction City, Kansas. 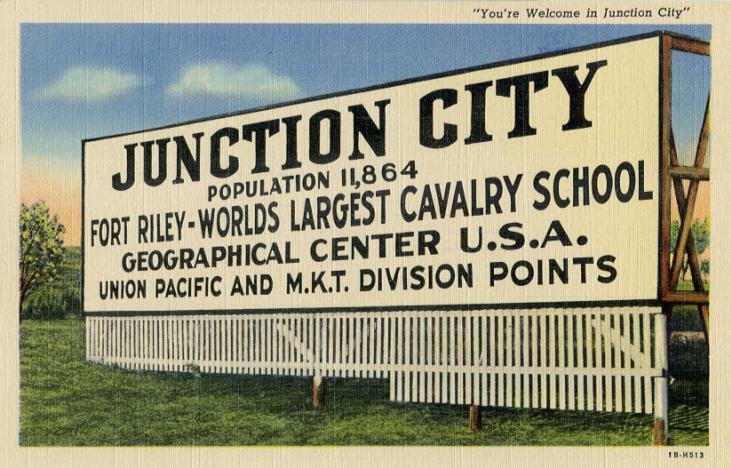 Originally, it was named "Camp Center" due to its proximity to being at what was thought as the geographical center of the United States. 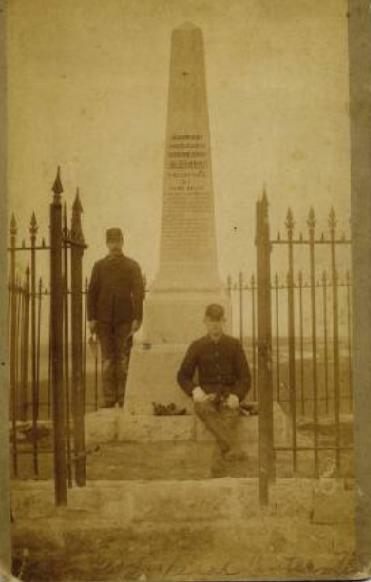 In 1855, Brevet-Major Edmund A. Ogden was among seventy people who died at the fort when cholera swept through the area. 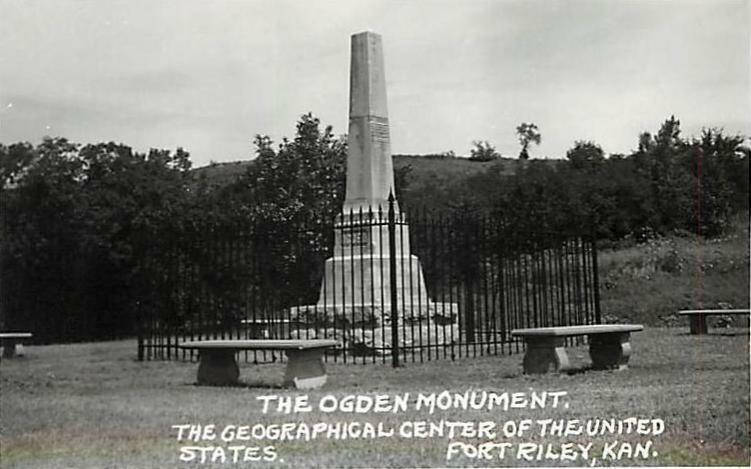 A monument consisting of a pile of loose fitting stones were placed on a prominent hilltop to commemorate Ogden. 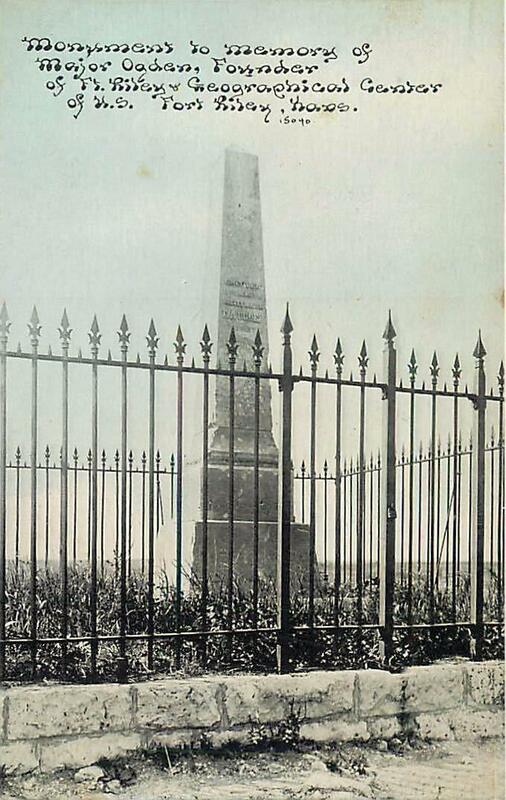 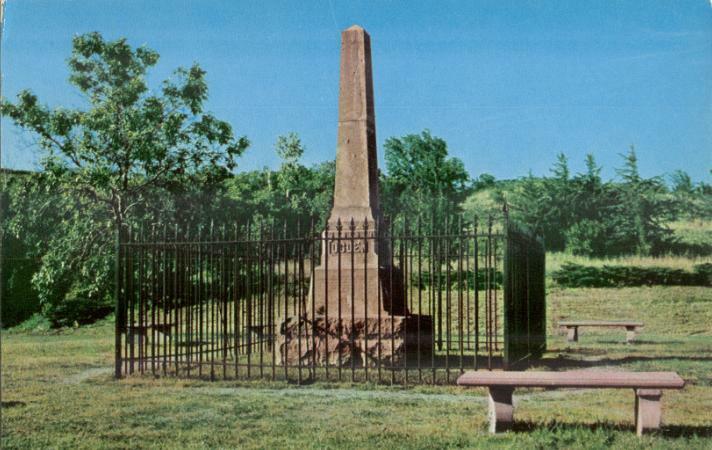 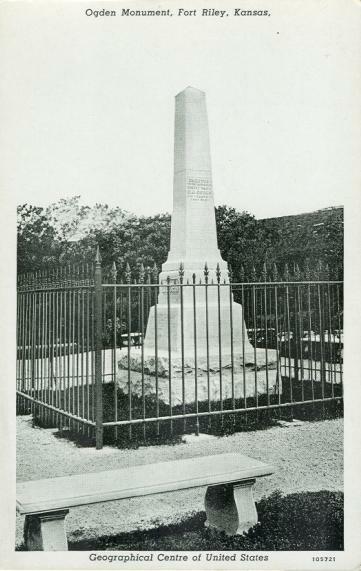 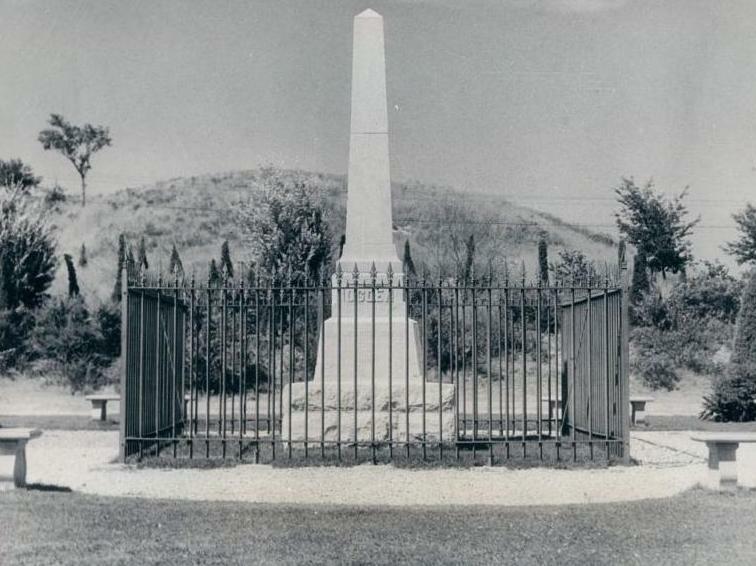 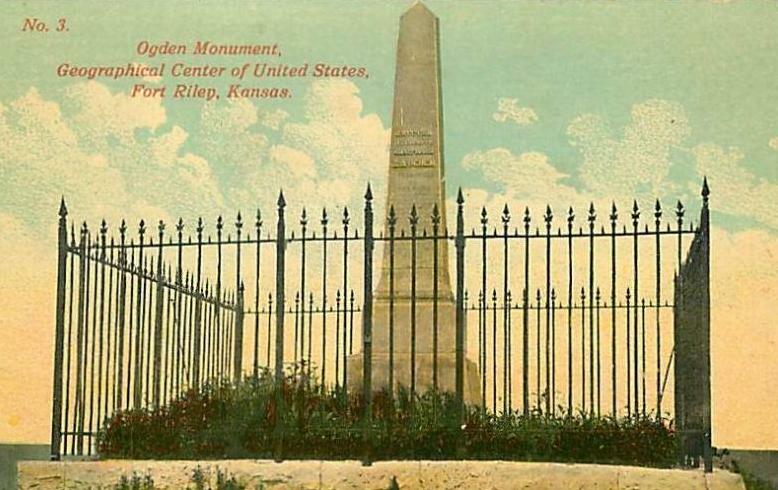 In 1865 or 1866, a stone obelisk was placed at the location as a permanent memorial to Ogden. 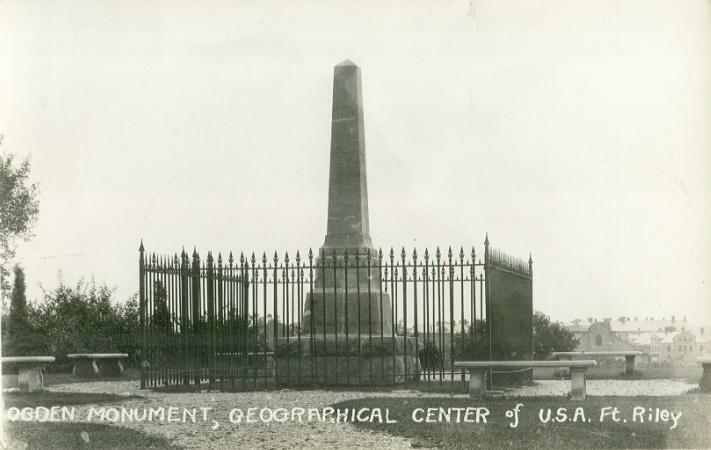 The obelisk quickly became known as a marker for the geographical center of the United States even though no wording as such ever appeared on the monument. 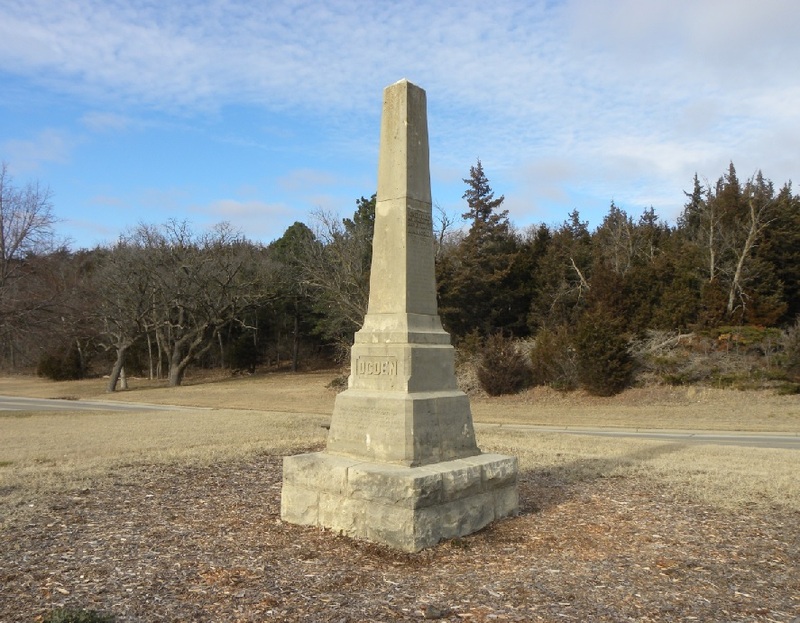 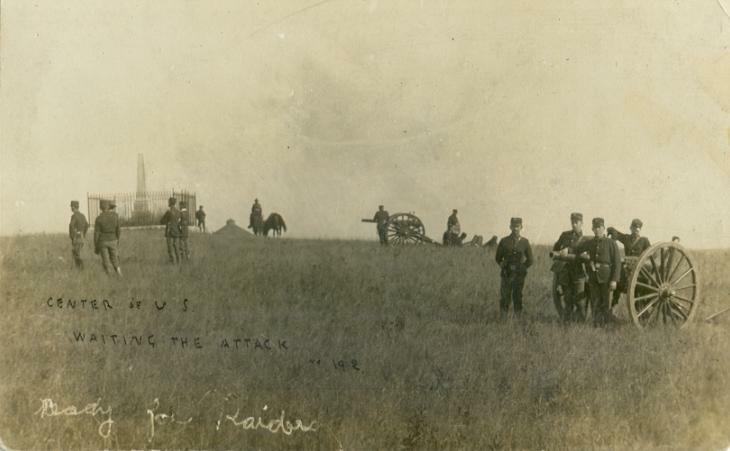 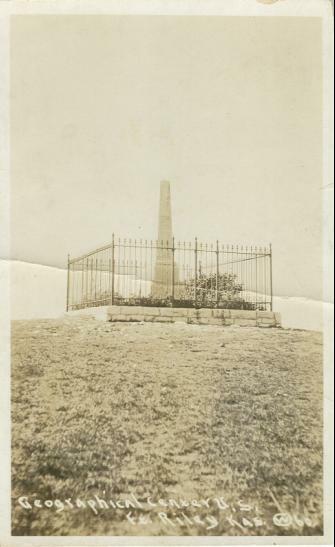 In 1923, a different, but nearly identical monument was placed approximately 300 yards south of the hilltop monument so that it was located along a road and more visible to the public. 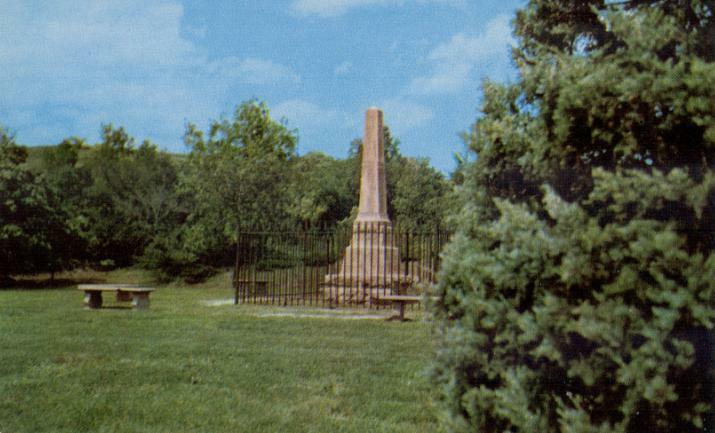 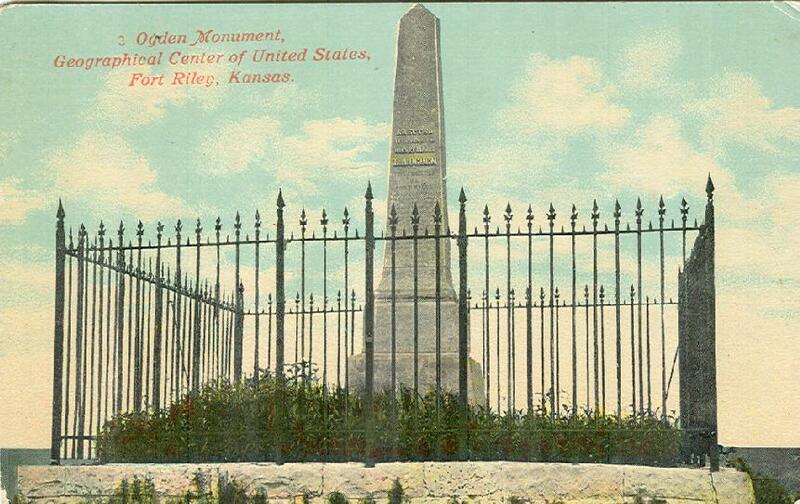 The top portion of the original hilltop monument was moved to a location outside of the Cavalry Museum. 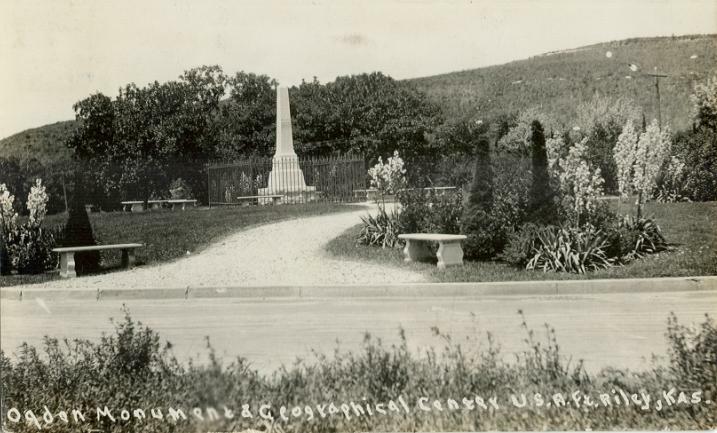 Today, the roadside monument and the monument by the museum are still existing. 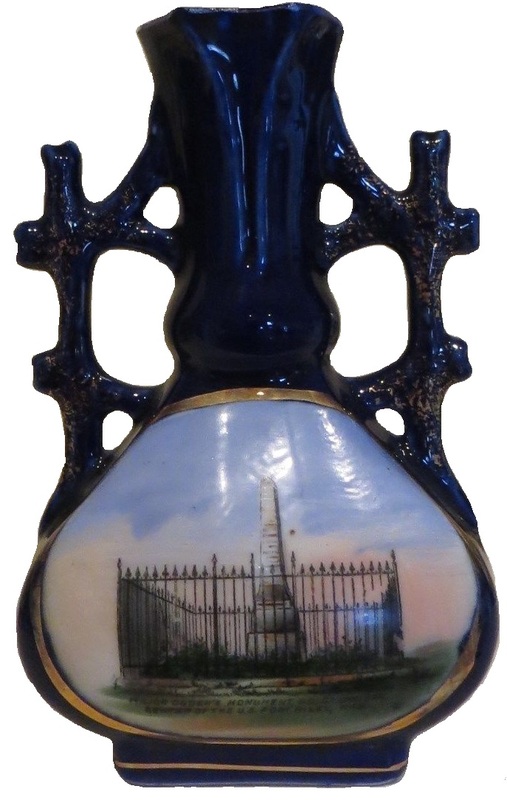 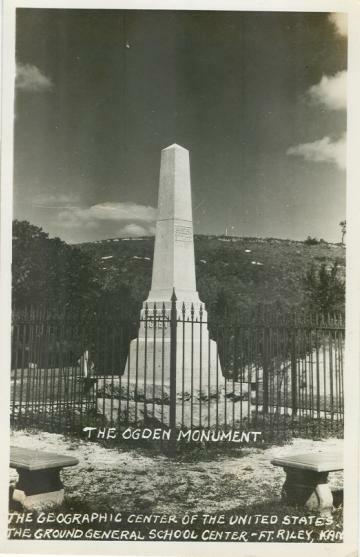 The base of the monument on the hilltop can be found with a little search and has a barely legible inscribing stating it was the original Ogden monument. 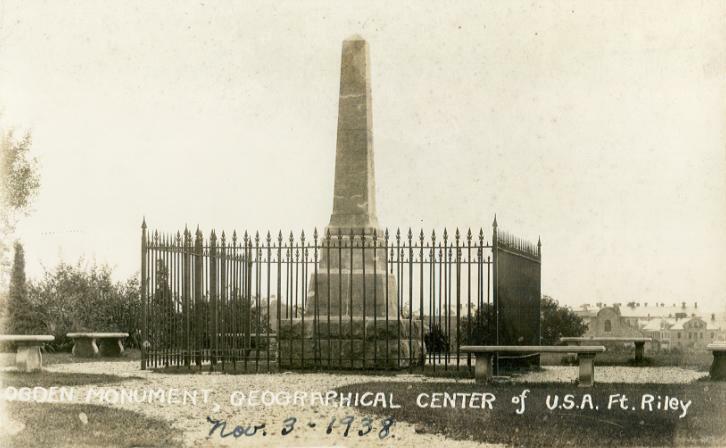 The latitude/longitude positions listed above reflect the locations of all three monuments. 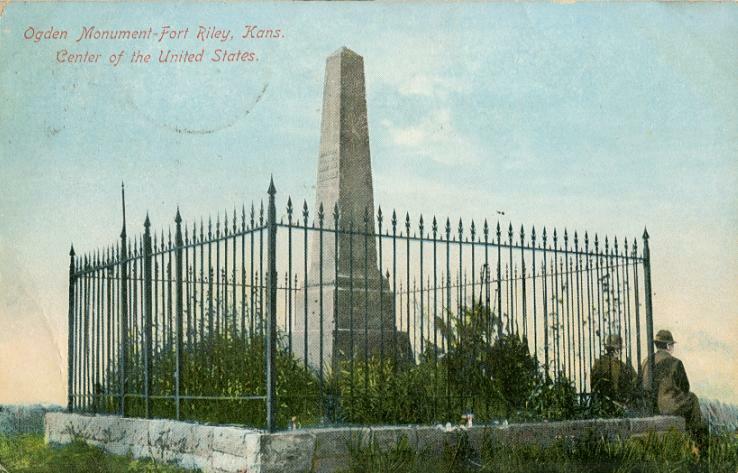 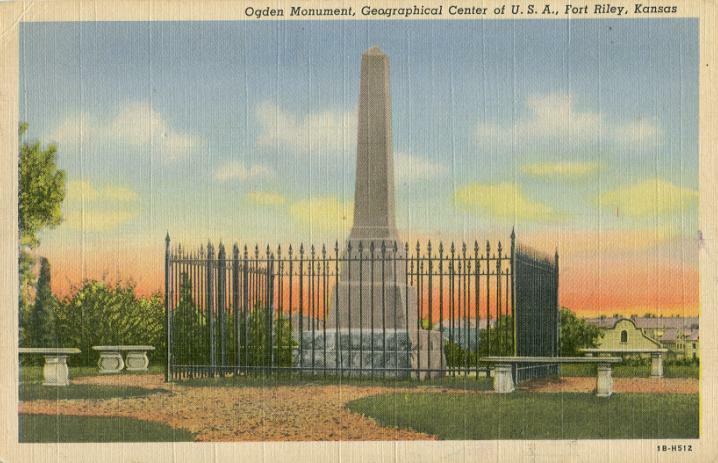 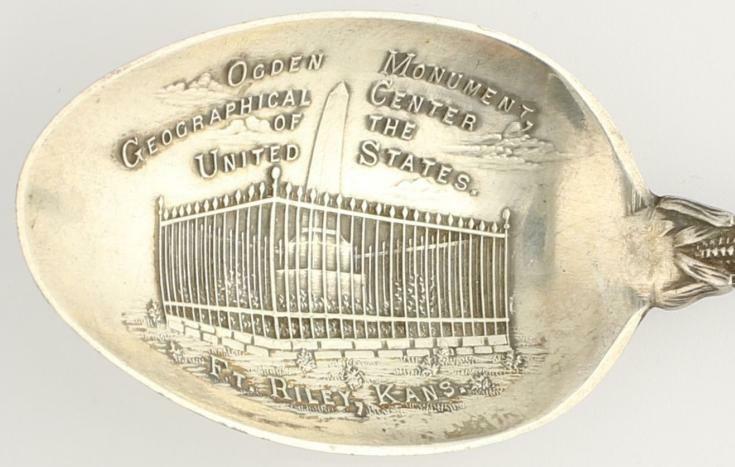 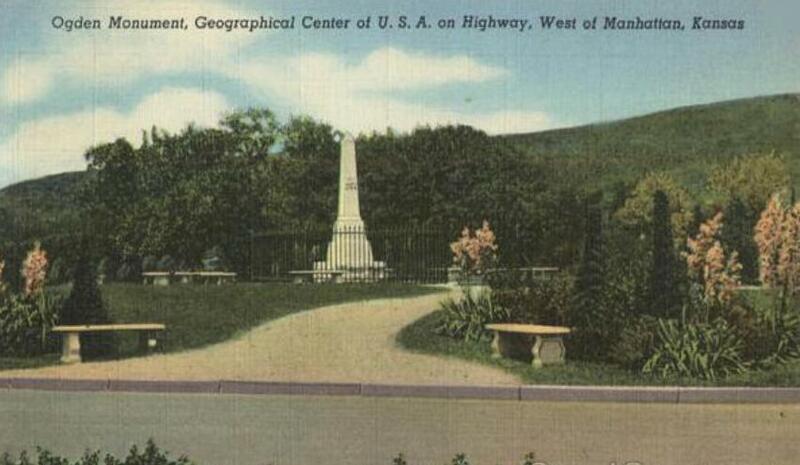 Thousands of postcards were produced that state the Ogden Monument was also the "Geographical Center of the United States" even though it was never officially designated as such. 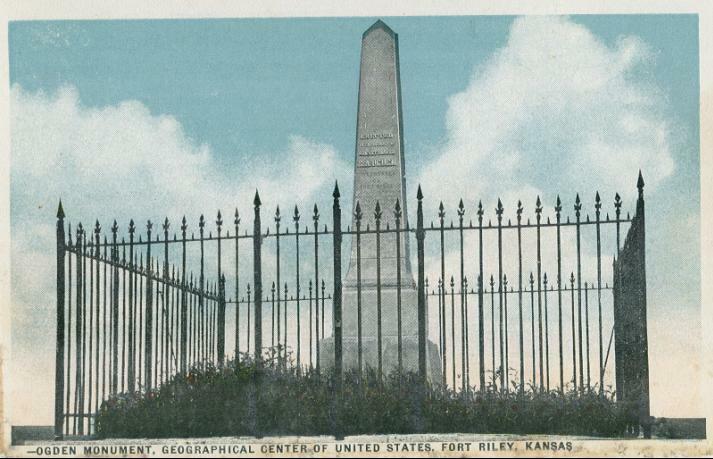 This should be considered our nation's first Geographical Center monument. 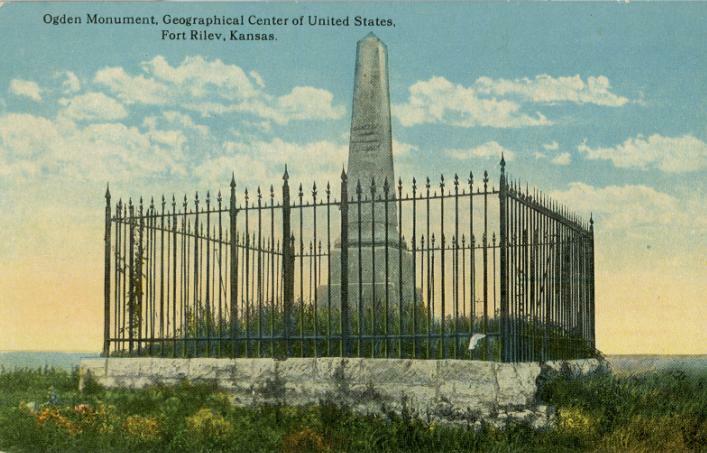 Since Fort Riley is a military base, access is restricted and a visitor's pass must be obtained from the visitor's building at the east entrance to the base on Henry Drive. 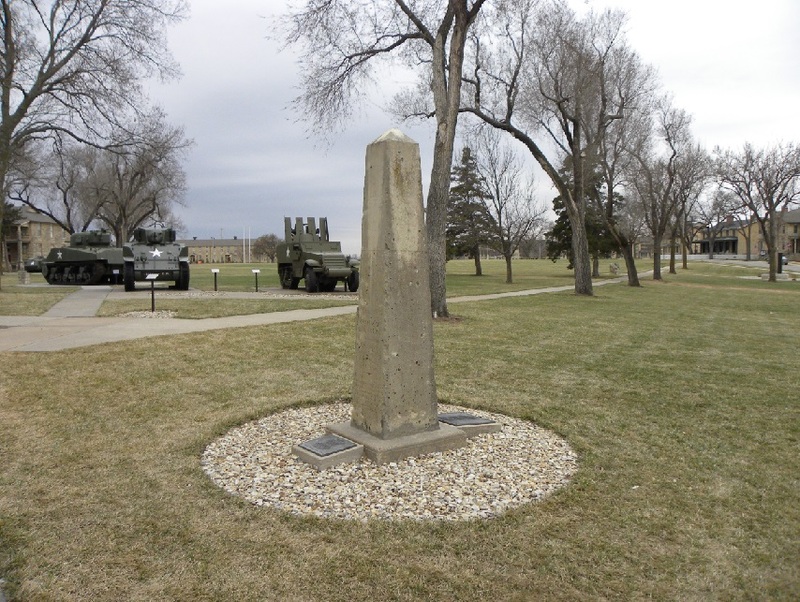 First time visitor's will need to fill out paperwork, submit photo identification, and wait for a background check before being issued a pass onto the base. 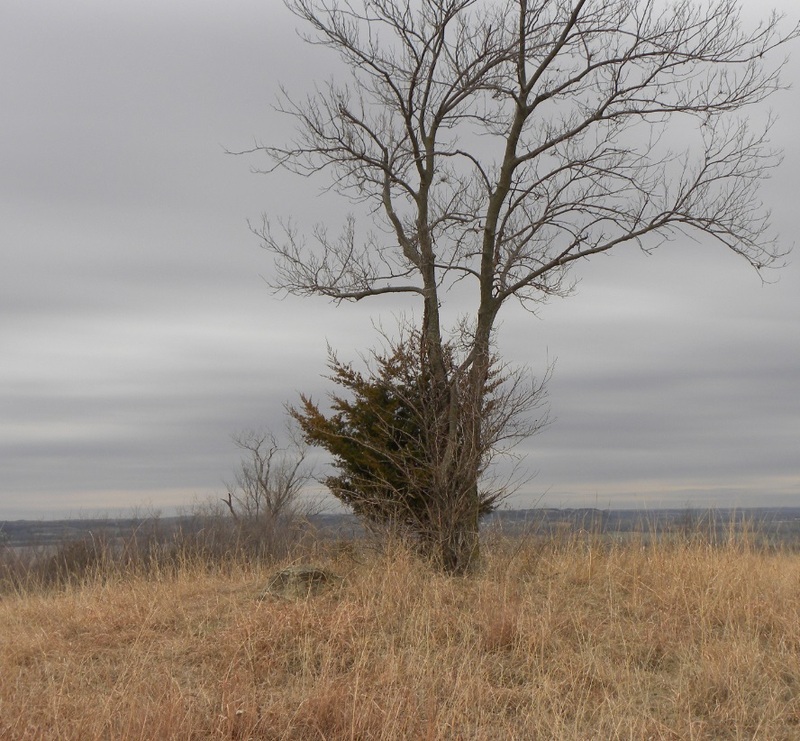 This process usually takes less than 30 minutes. 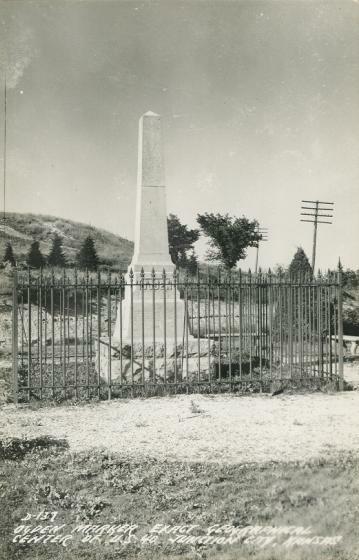 The roadside monument near the cemetery. 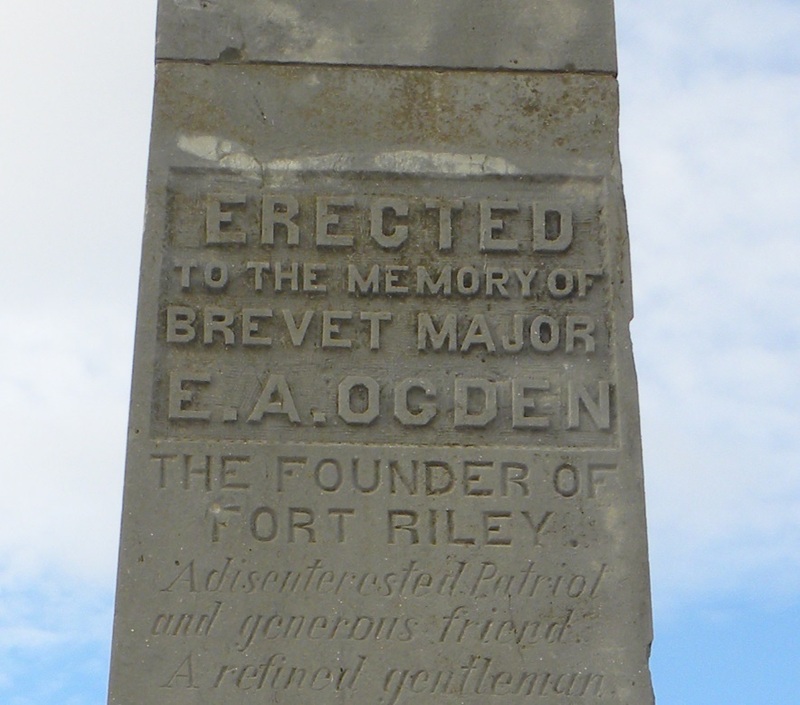 Text on the roadside monument honoring Brevet-Major Ogden. 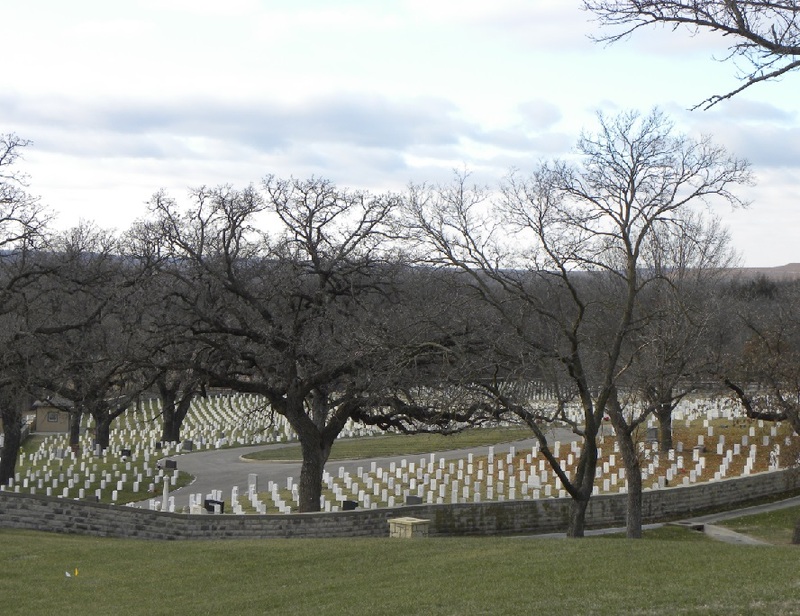 View of the Fort Riley Cemetery looking to the northwest from the Ogden Monument. 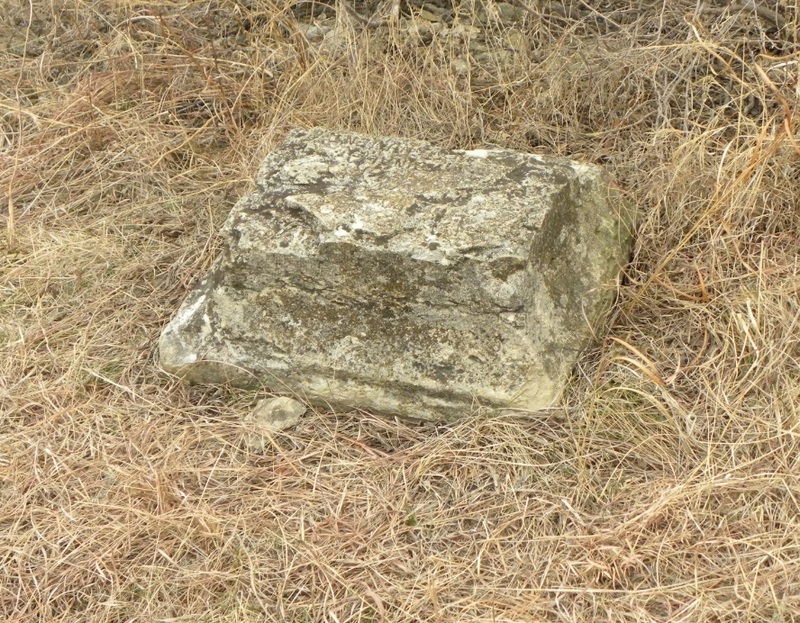 Historical sign on the fort along the north side of Huebner Road. 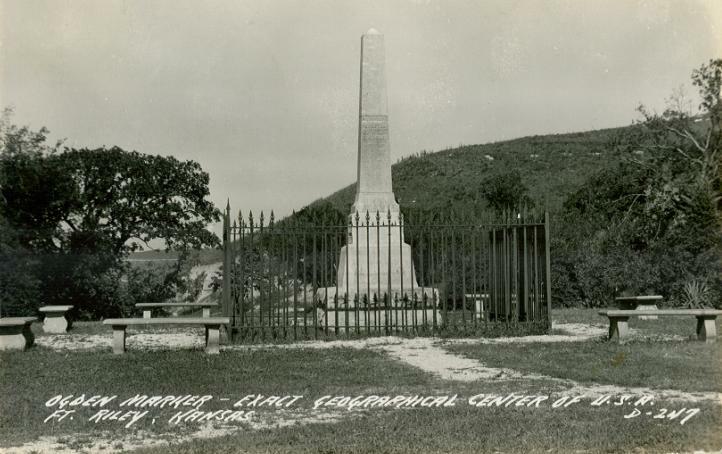 The hilltop where the original monument stood. 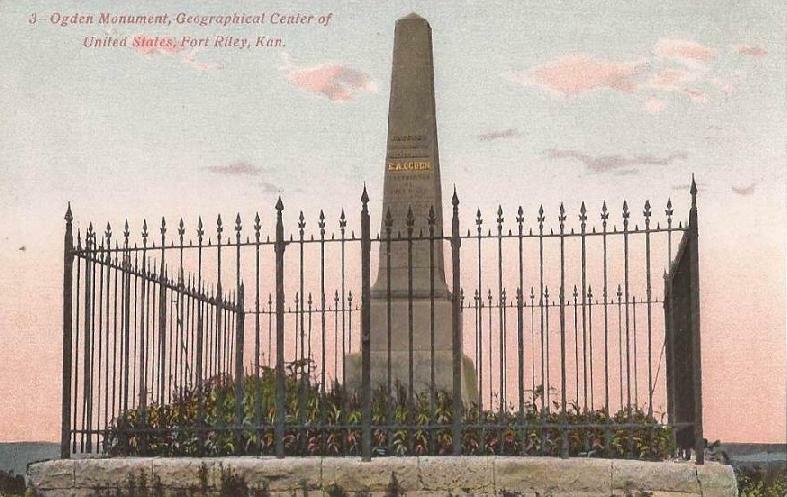 The base of the hilltop monument. 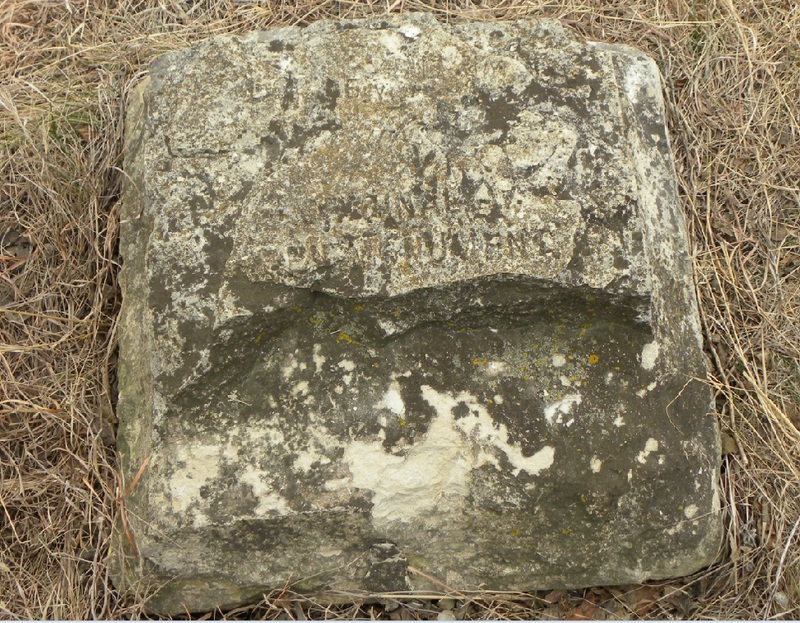 Barely legible inscribing on the hilltop monument base reads: "ORIGINAL OGDEN MONUMENT". 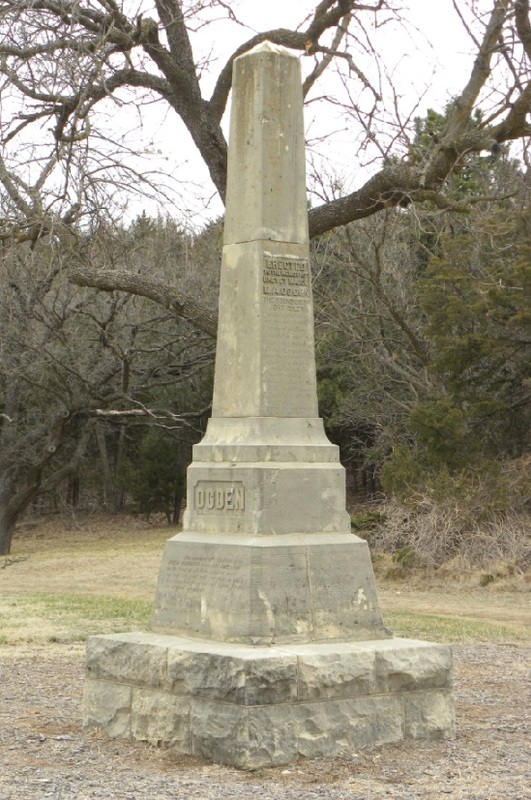 The top portion of the original hilltop monument now located at the Cavalry Museum. 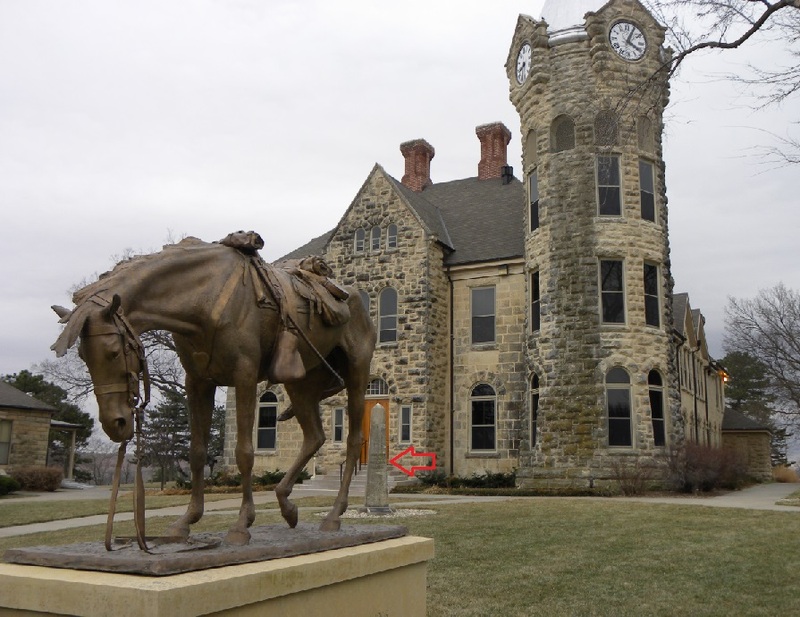 (Red Arrow). 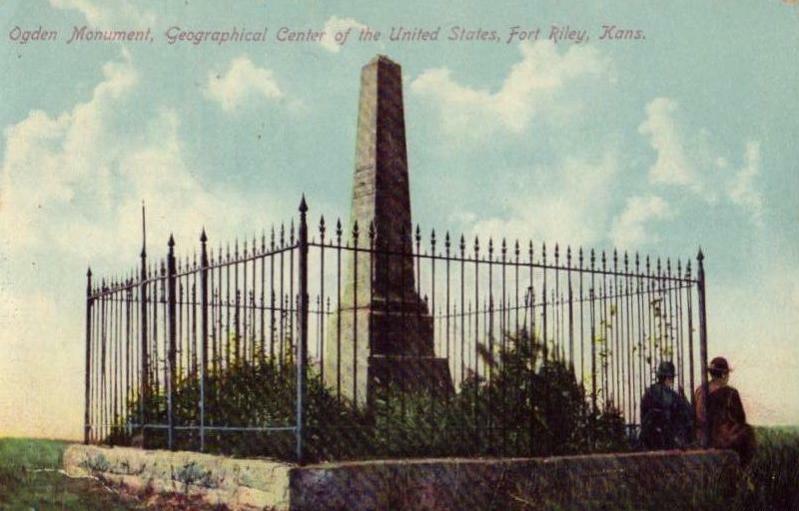 The top portion of the original hilltop monument. 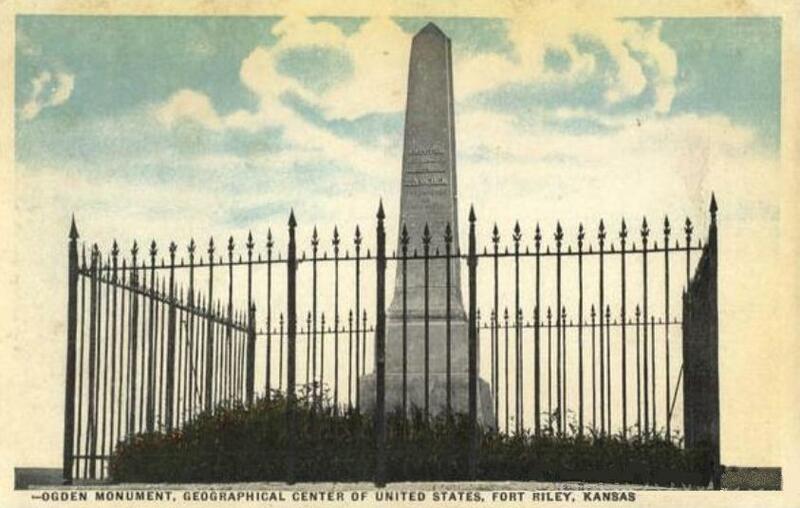 Kansas City Journal. 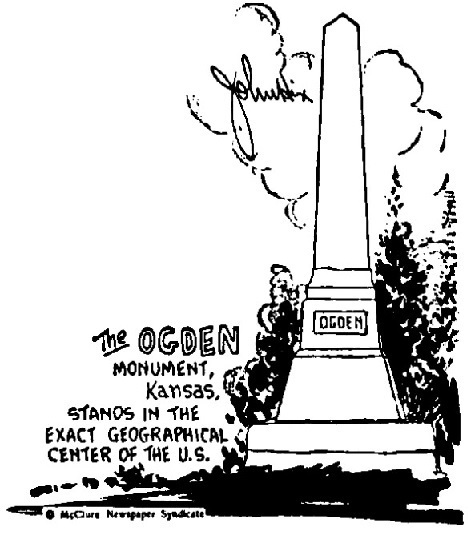 September 4, 1898. 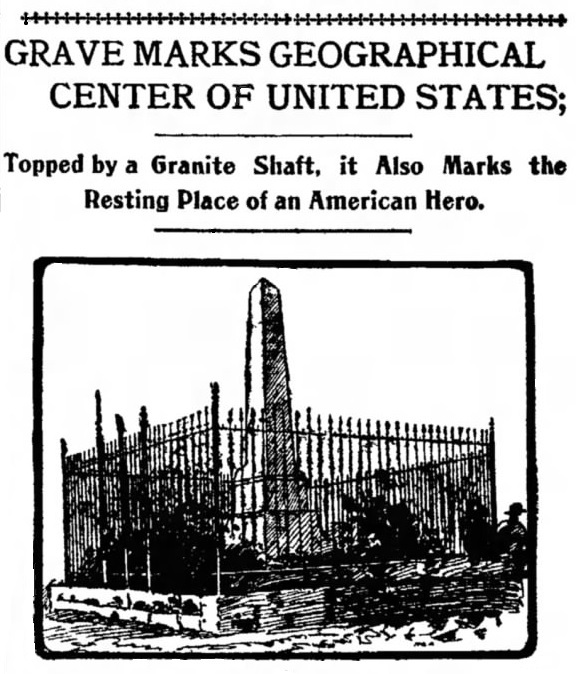 Sandusky (Ohio) Star-Journal. 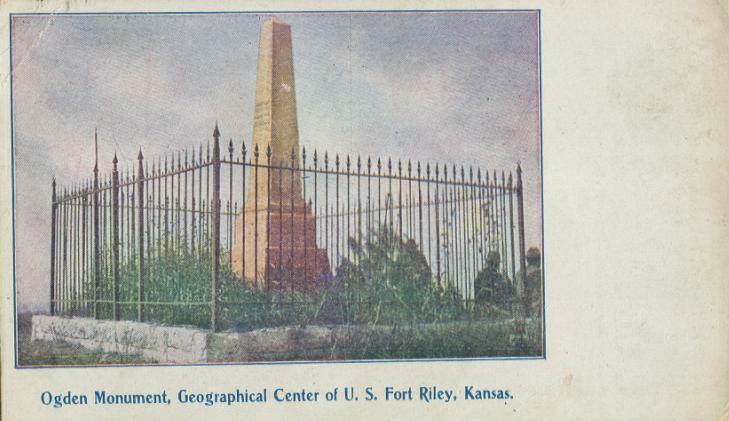 August 20, 1903. 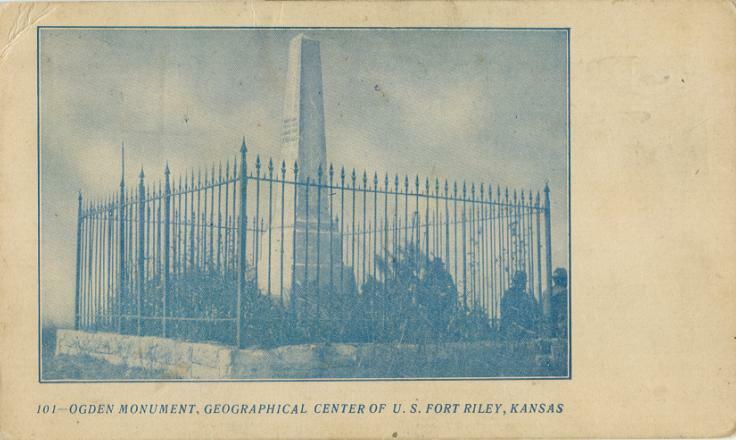 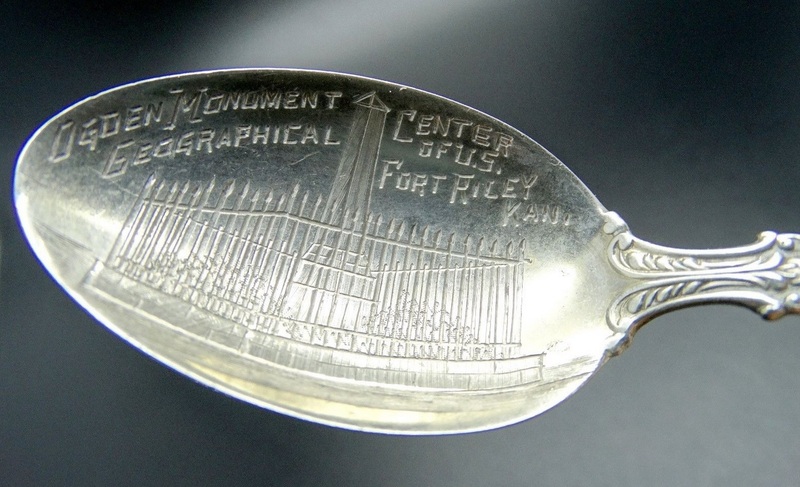 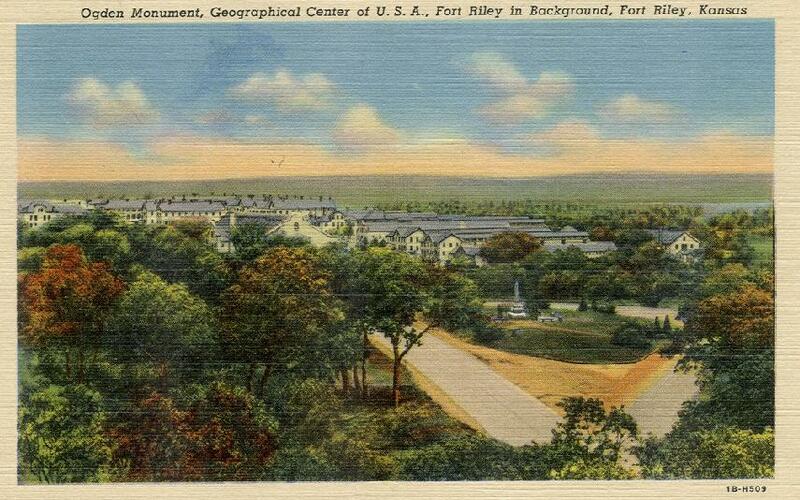 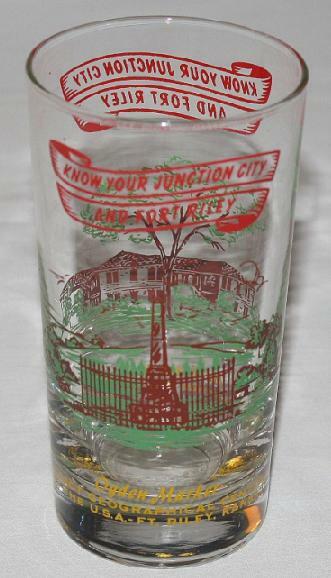 Many years after Lebanon, Kansas, had been named the new "Center", Fort Riley was still getting recognition. 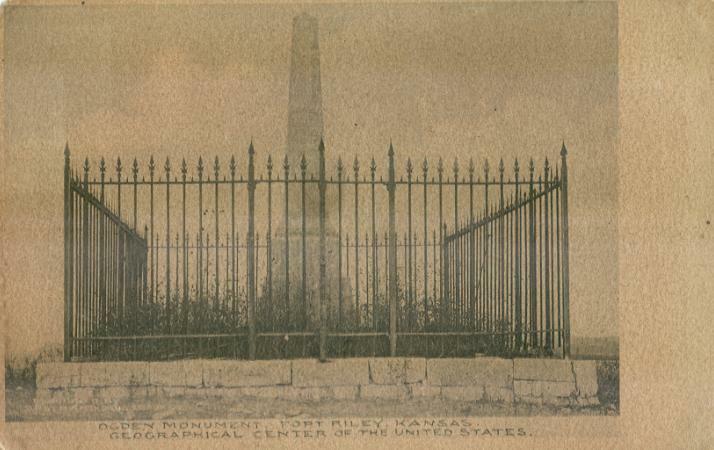 The Lincoln (Nebraska) Star. 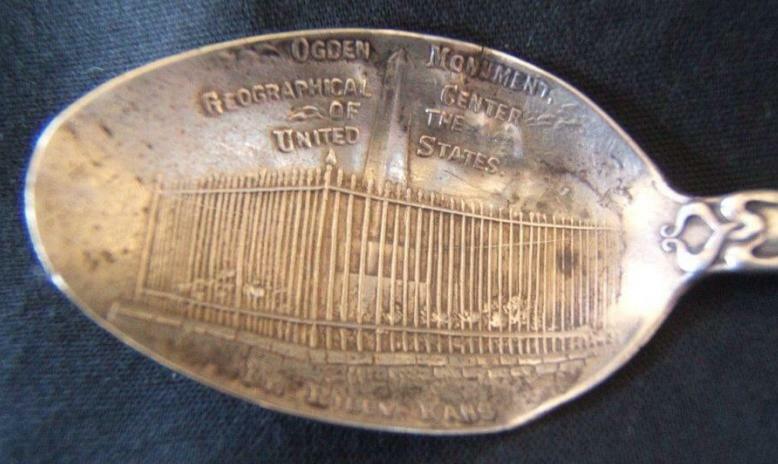 November 13, 1930.